Barring the initial stages of introducing solid foods, my kids have always eaten what we've eaten. At first their portions contained less salt, but never less herbs or spice (unless we were eating something really pepper-y). I never understood why people would feed their children bland meals. (Do you like chicken with nothing on it?) Or worse, make something tasteless while the adults eat something yummy. I want my children to have a developed palate and experience lots of flavors, so after they were 7 months old, I stopped cooking them "baby food." I grew up eating prosciutto, crostini di fegato, and bottarga; chawan mushi, sushi, and sashimi; kimchi, cool noodles and kalbi; peking duck, dim sum, and thousand year old eggs, and I want my children to do the same. My mom made almost everything from scratch from pasta sauce to Korean mung mean pancakes, and, a barring the occassional foray into boxed mac and cheese- and Morningstar Farm-ville (I'm no martyr, trust me), I strive to do the same. I strongly believe that cooking good, fresh food (it doesn't have to be complicated at all) is the way to teach children to appreciate and enjoy food. I'm not quite sure how picky eaters are created (or if they are born that way), but I have my own ideas. In general, though, I think if kids are exposed to lots of different foods in an environment where they see their parents cooking and enjoying lots of different foods, that's half the battle. Not forcing kids to eat or playing other "food games" is also important. 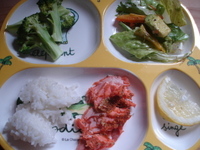 So is involving your child in meal preparation in age-appropriate ways. Flip through cook books and cooking magazines with your children. Bunny loves doing that. She points to all the things she likes and we talk about what makes them so good. If you are lucky enough to have a garden that you eat from, I think that helps. (We have to settle for going to farmer's markets where the girls can taste everything.) Then again, kids really do have minds of their own, so who knows. We don't have hard-and-fast rules about food in our house, but I do have guidelines I feel are important. We sit at the table and eat (no walking around with food). I serve lots of vegetables and fruits. We do try to limit sweets, but some juice is fine. We don't usually eat dessert, but when we do it's often fruit. They don't ever have to clear their plates, but they do have to taste new things (licking doesn't count). If they don't like what's for dinner and they are hungry they can have yogurt or an apple, but that option is rarely excersized. (I can think of one time Bunny went that route.) Of the combination of things I serve for dinner, they can usually find something they like to eat. 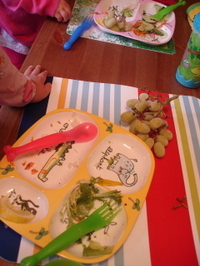 Both kids started out eating everything and then Bunny, my four-year-old, developed her own ideas about what she liked and how she liked them. She doesn't really flat-out refuse much of anything (cooked pineapple, bean sprouts, cooked spinach, and raw fish come to mind), rather, she's particular about how she wants it served: pasta without "too much tomato sauce," for example. Wallie, my two-year-old (tomorrow! ), still eats mostly everything, but we expect some pickiness to be rearing its head soon. Why do I cook the way I do? It's partly for me and partly for my children. The fact that they will eat it? Why yes, I do feel lucky! And proud! My favorite "warms-the-heart," comforting pasta dish is the one I grew up eating: spaghetti con burro e pomodori. My mom was a working mom so it was a dish she could throw together quickly. The beauty of this sauce, like so many good pasta sauces, is that in the time it takes to boil the pasta water and cook the pasta, it's done. The recipe is simple, but the key is to use the best ingredients you can get your hands on. Don't skimp on quality. Buon appetito! Put pasta water on to boil. Salt it generously. When water boils, add in 1 package of (thick) spaghetti. Cook about 1 minute less than package indicates for al dente pasta. In the mean time, melt 1/2 cup of unsalted, best-quality butter in a saute pan ove medium heat. When butter starts to foam, add 2 cloves of minced garlic. Heat until butter smells garlicky and is completely melted then dump in a large can of imported San Marzano whole, peeled tomatoes. Smash tomatoes up with a wooden spoon. Continue simmering until sauce is reduced by about a third, 20 minutes or so. Salt and pepper to taste. Toss with hot, cooked pasta. Pass the grated parmesan or pecorino romano cheese. (My family is Roman, so we prefer pecorino romano.) Serves 4 as a main dish or 6 as a starter. I have previously blogged about my love for soup. I have a soup thing and make it about once a week. In the summer I love to make cold soups (gazpacho, cucumber) and sip them when the weather is hot. This recipe is my take on vichyssoise, the humble French potato-leek soup that is served cold. Today I whipped this together while the girls were eating their breakfast. I share this only to let you know that it doesn't take a lot of time. While both children are occupied, that's my time to cook so I make the most of it! Your chopping technique doesn't matter here—you are going to puree this soup. And don't be put off by the pungent, black-licorice-smell of the raw fennel. When it's cooked, it mellows and adds a nice sweetness to the soup. In a heavy-bottom soup pot, melt butter and oil over medium-high heat. When butter is foamy add the leeks, fennel, and garlic plus a pinch of salt. Let the veggies sweat until they are softened, about 10 minutes. Stir occassionally and if butter starts to brown, reduce heat a touch. Meanwhile, chop potatoes into 1-inch cubes. Add potatoes to the pot along with the box of chicken broth. Bring to a boil and then reduce heat, cover and let simmer until potatoes are cooked though, about 20 minutes or so. Remove from heat. Stir in a pint of half-and-half and then puree the soup completely with a stick blender. (Important: If you use a regular blender let soup cool completely first.) If the soup starts to go all gluey as you puree it, keep adding splashes of half-and-half (or milk or water or broth or a combination) until soup returns to a velvety consistency. Taste for salt and pepper. Refrigerate. (You may have to thin again, see comments.) Serve very cold in chilled bowls with a dollop of creme fraiche or sour cream (if you like) and chopped chives. I love potato salads, especially this one. Preheat oven to 350º. Place potatoes, carrots, onion, and garlic in a roasting pan and drizzle generously with olive oil. Toss. Sprinkle with coarse salt and grind pepper over. Lay the fennel stalk on top of veggies. Cover pan loosely with foil. Roast covered for 20 minutes then remove foil and roast a further 20-30 minutes. Remove from oven, discard fennel, and then drizzle veggies with balsamic vinegar—not too much—2-3 times around the pan with your thumb over the opening of the bottle so vinegar flows out in a thin stream. Toss, transfer to serving dish. Devour. Parsnips, rutabagas, and/or beets would also be very tasty in this, as would a mixture of different colored potatoes. Fresh parsley to garnish would also be yummy.